Longtime U.S. 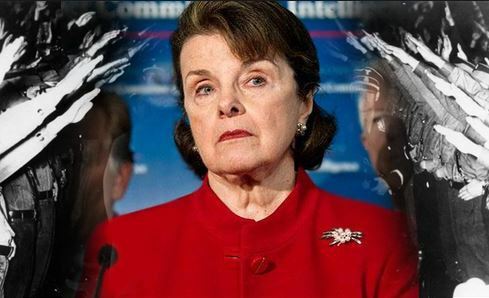 Senator Diane Feinstein held a town hall in Los Angeles yesterday where she called for a quick end to the Syrian crisis, also stating that Assad “should be ousted from office,” according to journalist Michael Tracey who was at the event. Feinstein sounds like she's calling for all-out war in Syria: "The time has come to end it… we have to take a more aggressive role." Just had a curious exchange with Dianne Feinstein re: regime change. Coming shortly. She also discussed Bernie Sanders’ medicare bill, asserting that it is a government “takeover” of healthcare, and furthermore reassured the frantic voters worried the new Red Scare that that the Senate is working to find the “witting agents of Russia” who are in the United States, according to Tracey. Feinstein previously made similar inaccurate statements earlier this week at another town hall in San Francisco, where she claimed that Assad has “participated in the killing of a half million of his own people.” With the latest chemical attack being questioned, putting the blame on Assad for an estimated number of deaths there is premature. She later brought up the recent airstrike in Syria ordered by President Trump, which immediately attracted boos from the crowd. Contrary to what Feinstein says, there is no such clause in the U.S. Constitution. The War Powers Resolution – likely what Feinstein refers to – is a separate piece of legislation and not an amendment to the U.S. Constitution in any way. As a longtime Senator, this verbal mistake must be humiliating. According to the U.S. Constitution Article 1 Section 8, only Congress has the authority to declare war. An act of war is essentially the same as a declaration of war throughout history and according to the legal definition. The last time the U.S. officially declared war was during WWII. Feinstein has received large campaign contributions from Northrop Grumman, a military weapons manufacturer that receives massive contracts from the U.S. government.